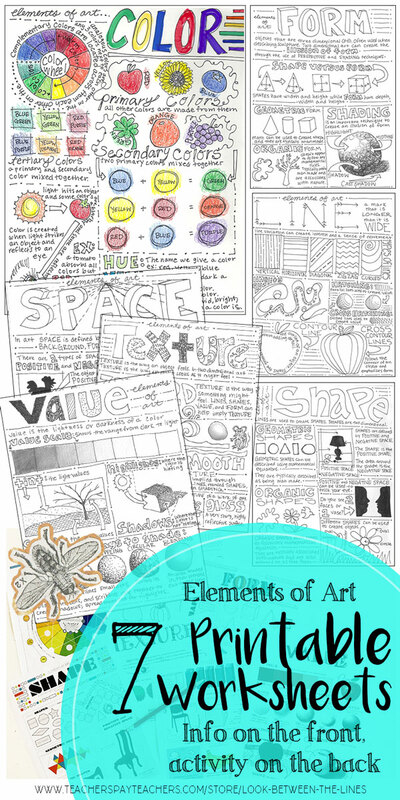 For the last three years, my best seller on my Teachers Pay Teachers website has been my hand drawn elements of art worksheet pack. 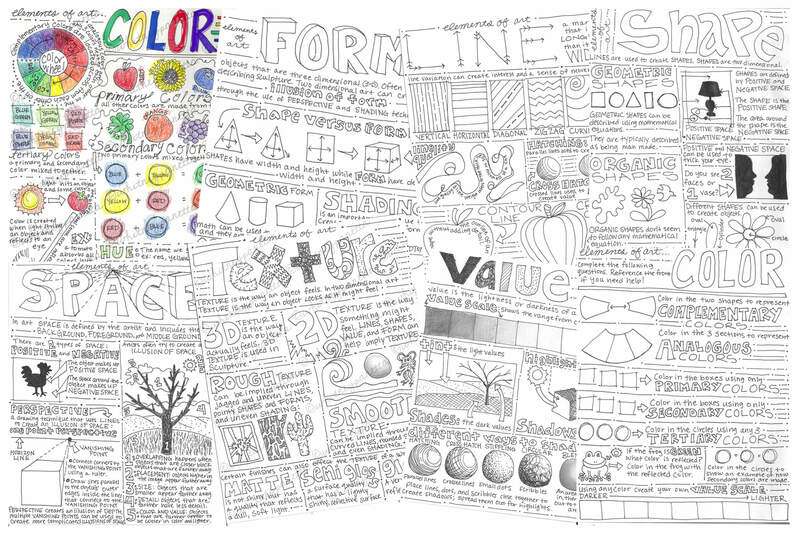 I spent the summer of 2014 drawing out my elements of art, principles of design, and visual journal how to worksheets. I carefully drew them in pencil, spell checked, had my husband spell check, and finally traced over everything in sharpie. Next, everything was scanned in, edited, and uploaded to my store. Hours went into that product, but it has certainly paid off. I have gotten a lot of great feedback and constructive criticism on my product. The biggest issue that has come up over the years is the legibility of my sheets. For the most part, they are fairly clear, but there are a few spots where text is squeezed in. In addition, students these days are more used to reading text off a screen than handwriting on a sheet of paper. While I enjoy the handmade aspect of these products, I decided it was time to bring them up to the modern era. Over Christmas break I began digitally redesigning all of my element of art worksheets. This task proved more difficult than I expected. I not only wanted to give it a more legible look, but I also wanted to maintain a modern feel, and provide new information. 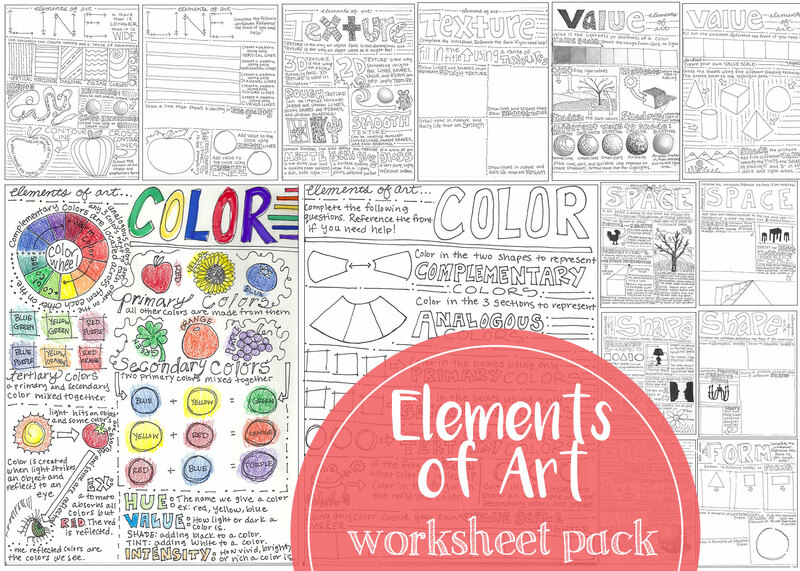 For example, if my customers wanted to review the elements of art in their painting class, they could get an entire new set of worksheets to use in their classroom. I thought this would be fairly easy, but there is only so many ways you can explain value. 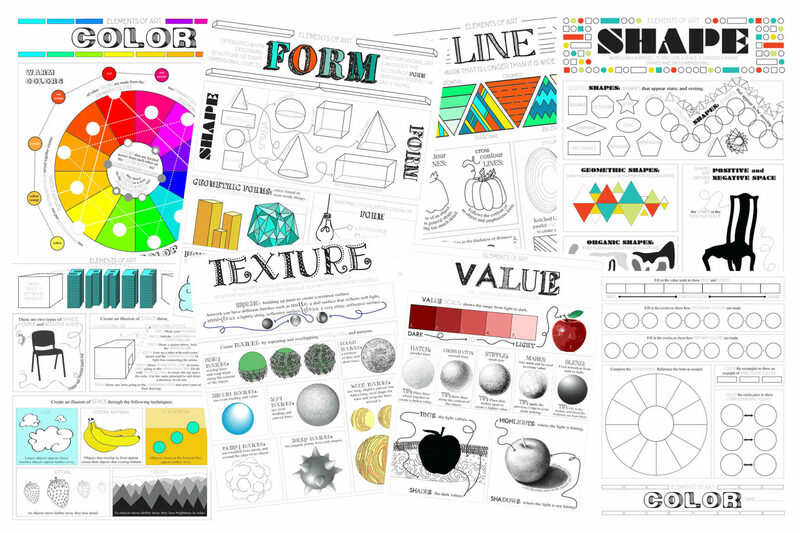 Once again hours were spent creating these new products, and finally, last night I uploaded the compilation pack of the seven worksheets. I love the new look and I am proud of the fact that the information was presented in a new way. A lot of the same things are covered, but with different explanations, examples, and applications. 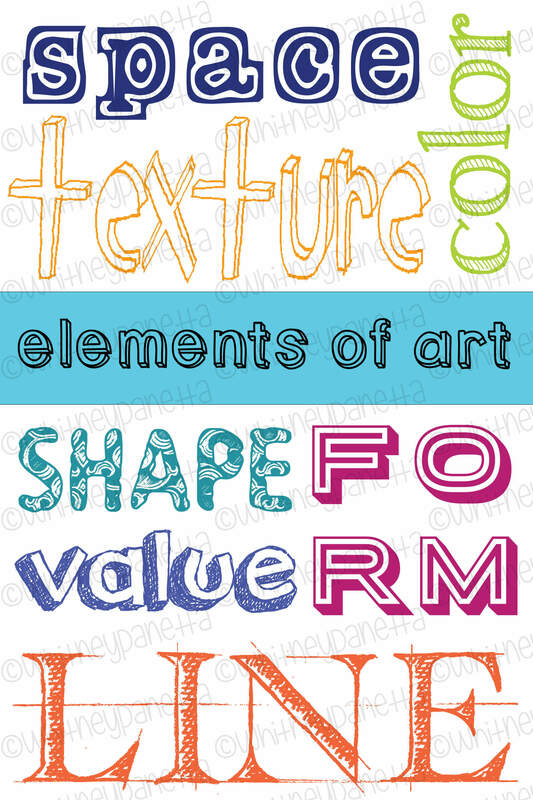 Like my original set, this pack includes the elements of art: color, line, shape, form, texture, value, and space. 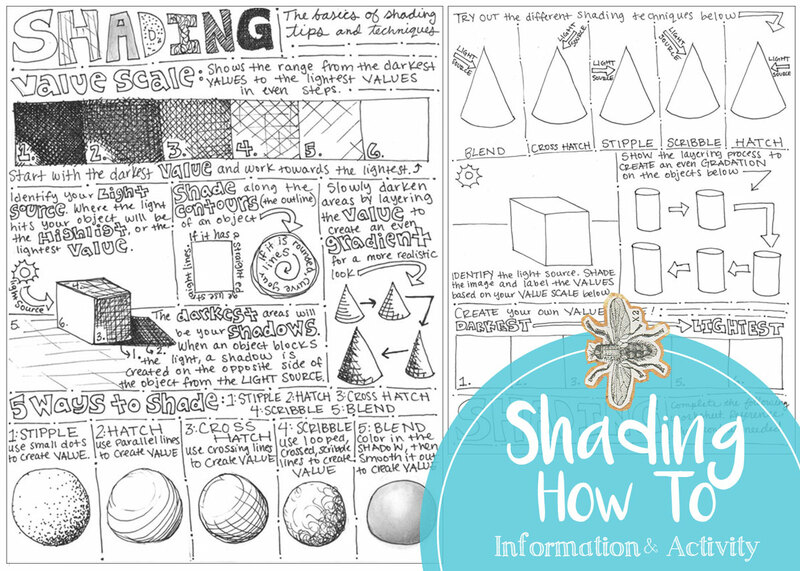 Each worksheet includes a color and black and white version of the front, and a back that tests the students’ understanding of the information on the front. These are great activities to get the students thinking about the elements and putting information to practice before final projects. 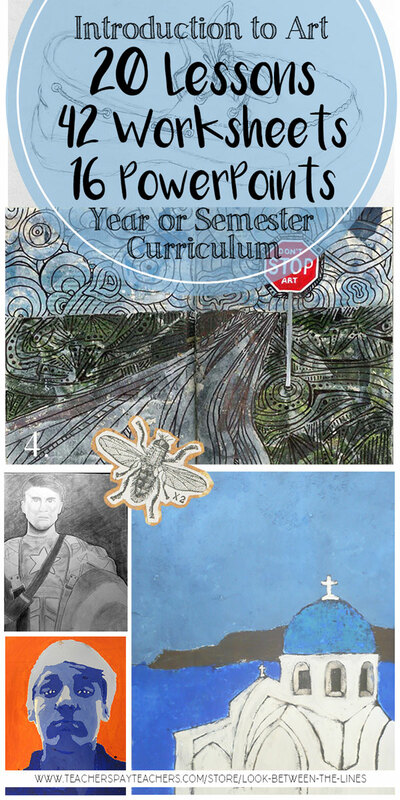 In addition to finally finished my updated elements of art worksheets, I am participating in the Teachers Pay Teachers end of school year sale. My entire store will be 20% off tomorrow (5/9/17) through Wednesday (5/10/17). That puts this pack at just $8.00. If you haven’t checked out Teachers Pay Teachers yet, give it a try. There is nothing better than finding great resources for your classroom and supporting your fellow educators at the same time. The majority of my profits from my store go straight to my pocket, TPT only takes a small percentage, making all my time and effort well worth it. We are almost there, summer is just around the corner. Thanks for taking the time to check out my blog! 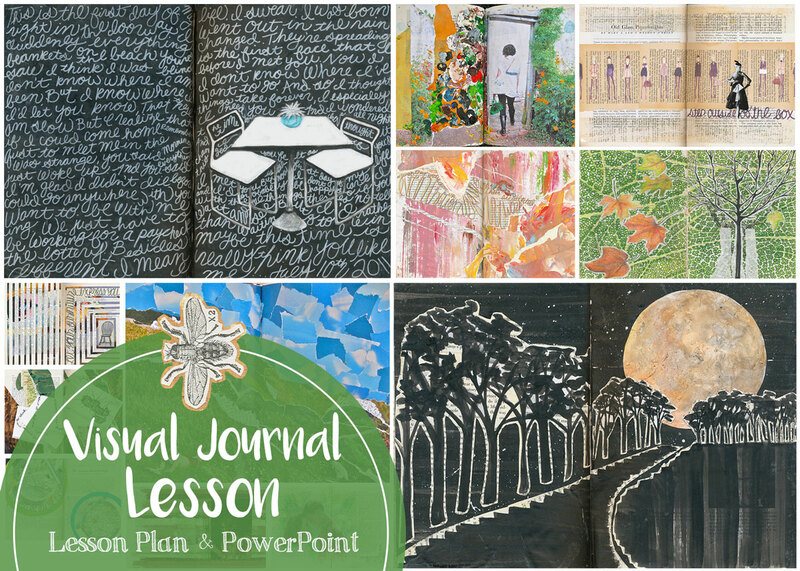 Help me spread the word about art education, teachers pay teachers, visual journaling, and crafting in general by sharing with others. Thanks for stopping by. As an art educator the elements of art and principles of design are something that is naturally incorporated into almost every lesson. They are the basics of strong, interesting, and successful works of art. 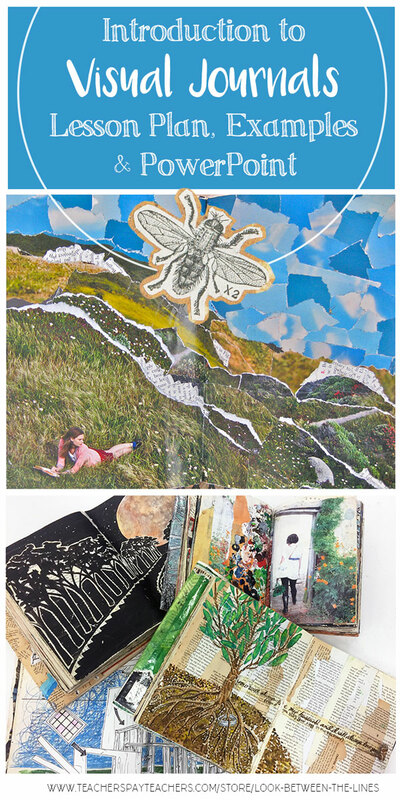 From the moment kindergarteners step into their first art class until an art major in college leaves their final studio course, the elements and principles should be an underlying theme. As I sat around enjoying my time over the summer, my mind continuously drifted to thoughts of the upcoming year. I had a goal, to add some decor to my classroom, to help make it my own space and brighten it. After some brainstorming, I decided what better way than to make my own poster set. 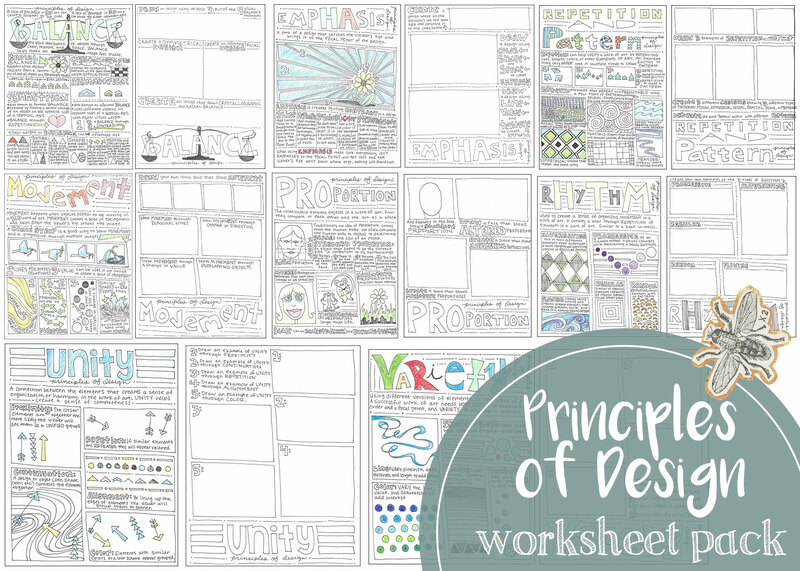 I got to work and created a poster to represent all elements of art and principles of design. Not only was it a great addition to my classroom, but it was also a nice addition to my Teachers Pay Teachers store (which I am now addicted to). Although this was the very last poster I made, it is the poster I like to start off with. 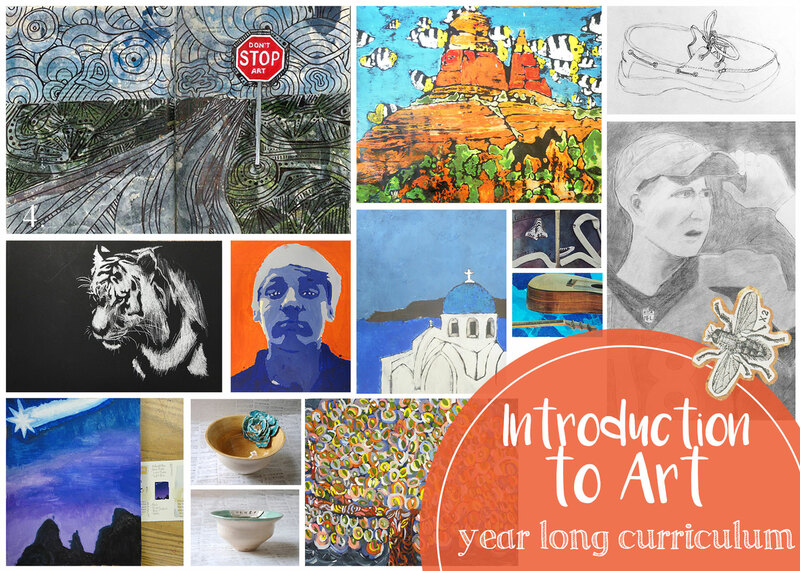 It showcases all the elements of art, including line, shape, value, form, texture, space, and color. I waited to the very end to make this poster because, first I wanted to determine which fonts would represent each element. Using Adobe Illustrator I added a rectangular, filled box in the middle, then laid out my text around it. There was a lot of adjusting and re-configuring as I tried to fit the lettering in just right. The color poster was my first creation, and I am very happy with the way it turned out. I love the current triangle trend, and decided it was a great shape to use in my posters. 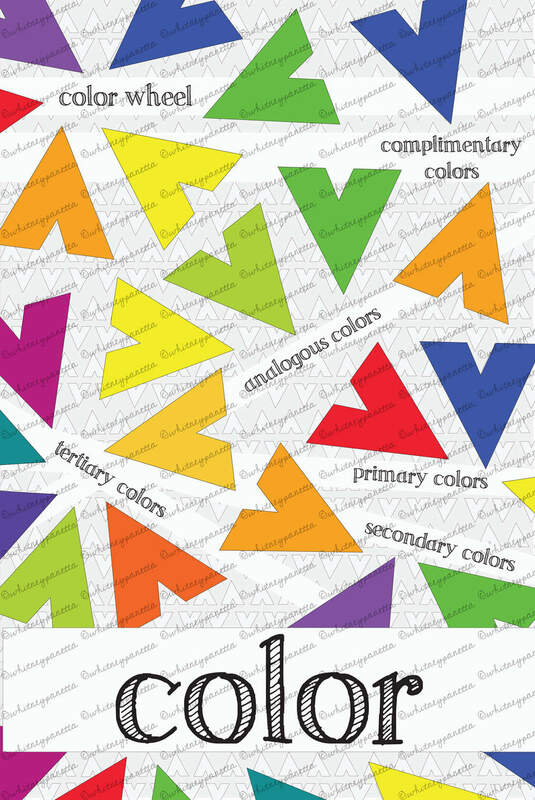 Using the line tool in Illustrator I constructed my arrowhead, triangle shape, repeated, resized, and recolored to to represent the various color groups. Primary, secondary, tertiary, analagous, and complimentary color examples are included. 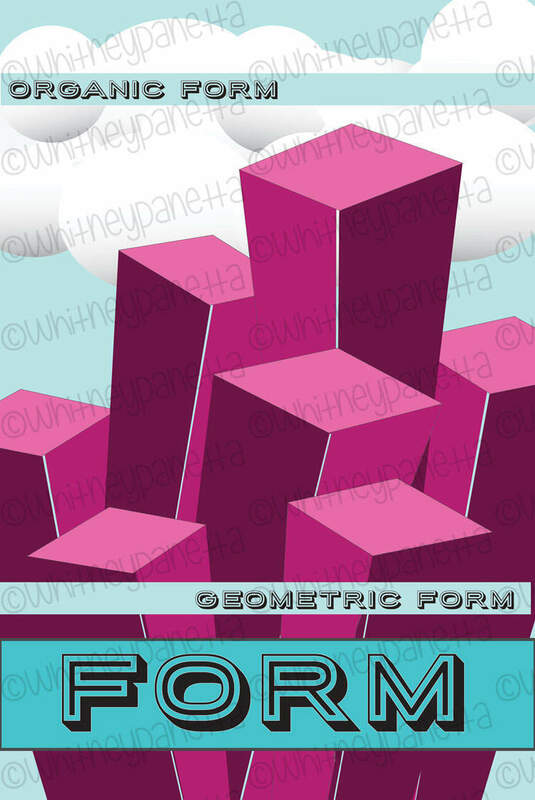 I was excited to work on the form poster, because it was a challenge to create the illusion of a three dimensional form on a two dimensional space. Once again I used the line tool to construct my block shapes, then filled them with color. I had fun using the circle and oval tool to create the clouds in the background. 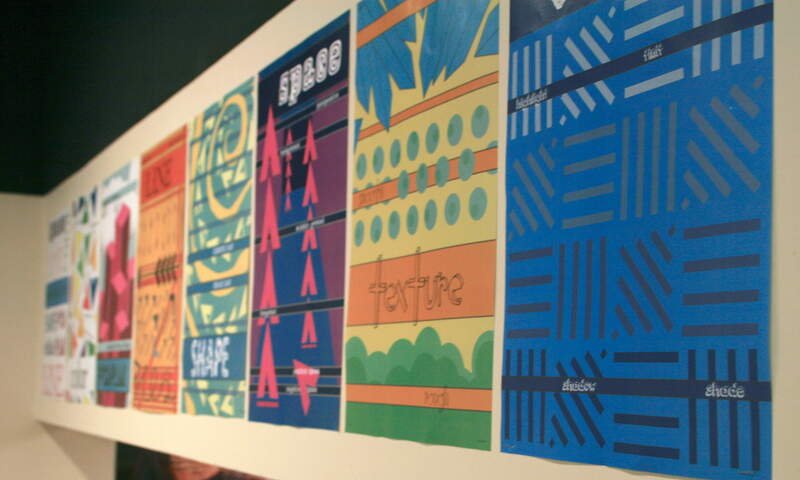 Examples of organic and geometric form are shown in this poster. Because I am so into triangle and arrow shapes, I was very inspired by the idea of line. 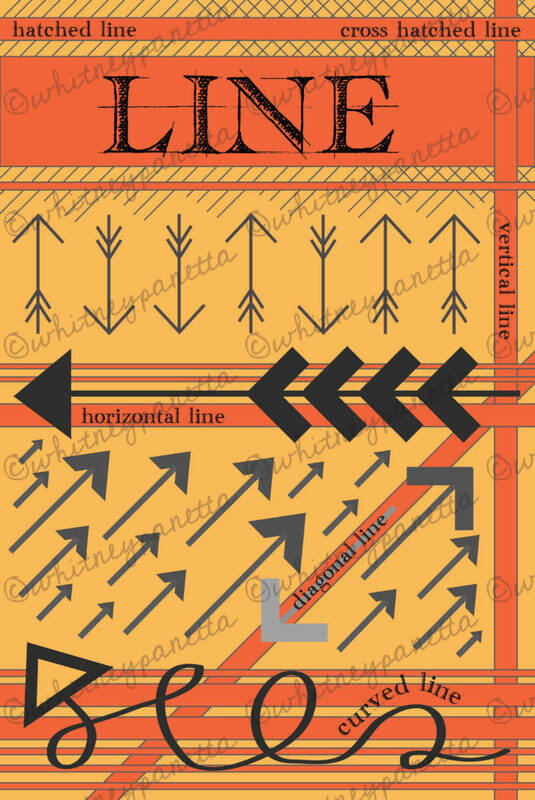 I used different variations of these shapes to represent horizontal, vertical, diagonal, and curved lines. I used straight lines behind the title to shape hatched and cross hatched lines, which added an interesting texture. I love the way the colors look on this poster. It is a nice contrast to the first two I completed. 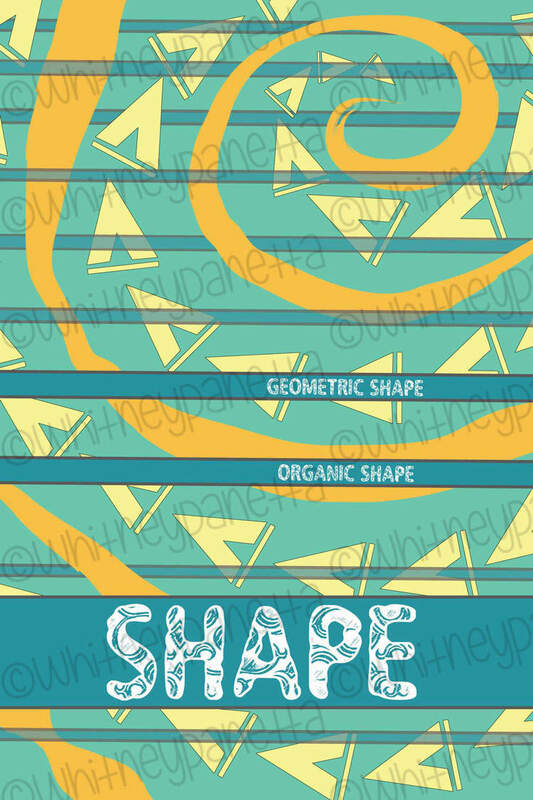 At first I was stumped by what to do for the shape poster. 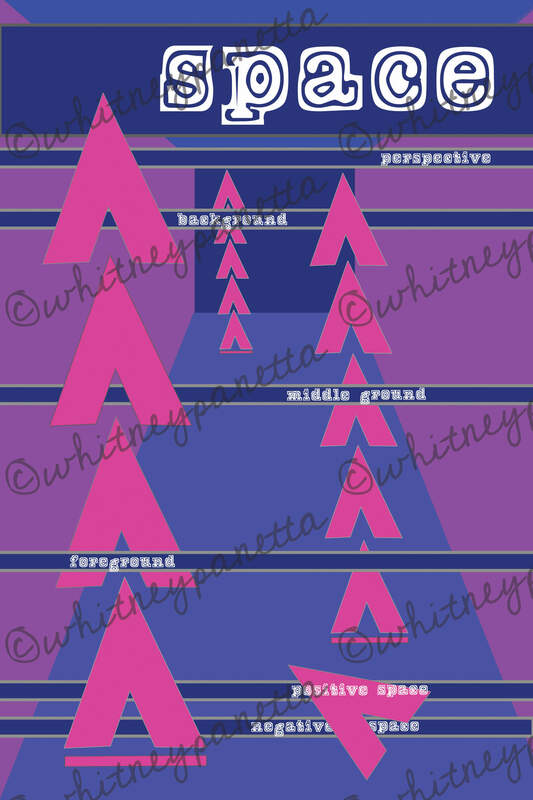 I decided to continue the triangle theme, to show geometric shape, but I was unsure what I could do for organic shape. After playing around with a few ideas I decided to use the brush tool in Illustrator and create a spiral shape. The geometric shapes fit nicely between the sections of spiral, which in turn made a very cohesive design. Space was another difficult concept to put on paper. I knew I needed to show perspective, in order to create a sense of space, so I began adding diagonal lines and playing with shades of colors. 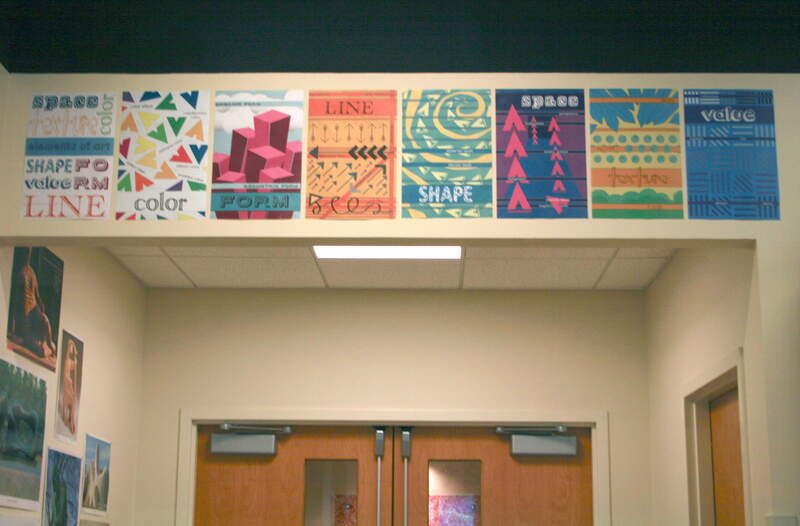 After I create the hallway looking area I decided to add more triangles to show foreground, middle, and background. I was able to create a send of space by making the shapes smaller as they moved back. In the foreground I also include an example of positive and negative space. 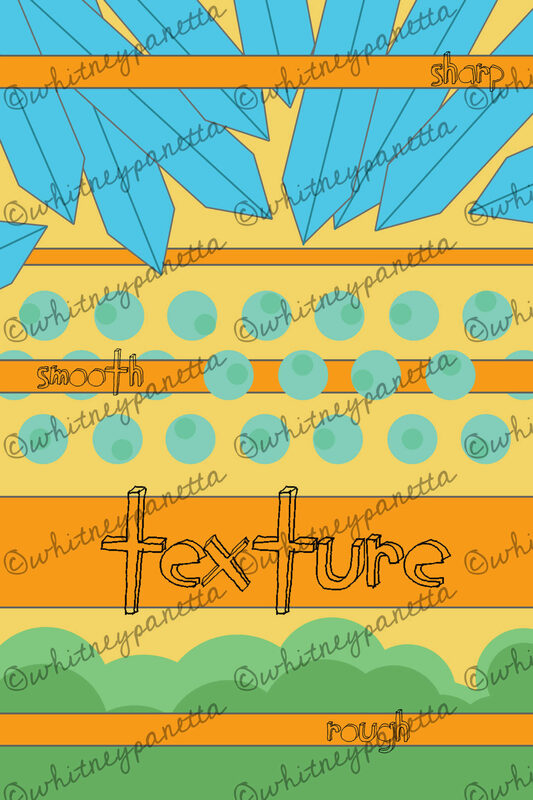 I had a lot of fun making the texture worksheet. I loved playing around with the various shapes in illustrator, creating my own Mario-esque world. I used dagger shapes to represent sharp, circles for smooth, and overlapping circles for rough. The bright colors are fun and youthful. The pop of yellow works nicely with the other posters. Finally, I was on my last element of art. 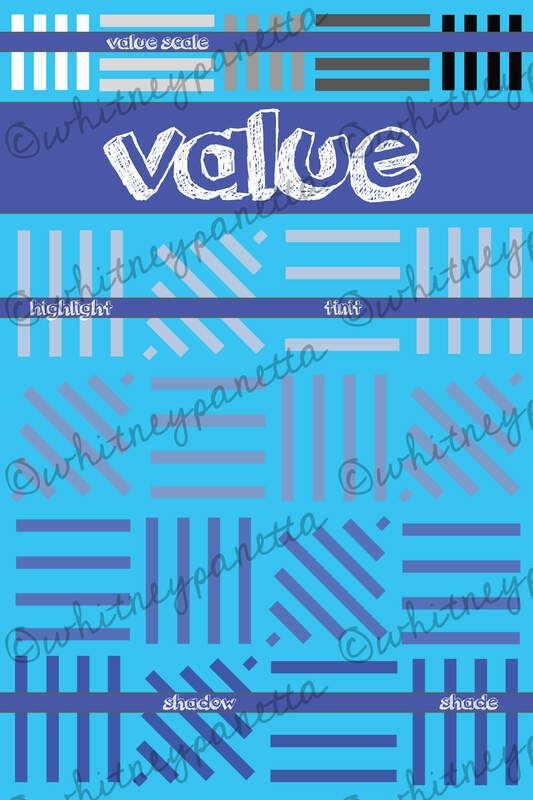 It was time to visually represent value. Since I used triangles in so many of the other posters, I decided to do something different. I created block shapes using thick lines, and varied the color from light to dark with each block. 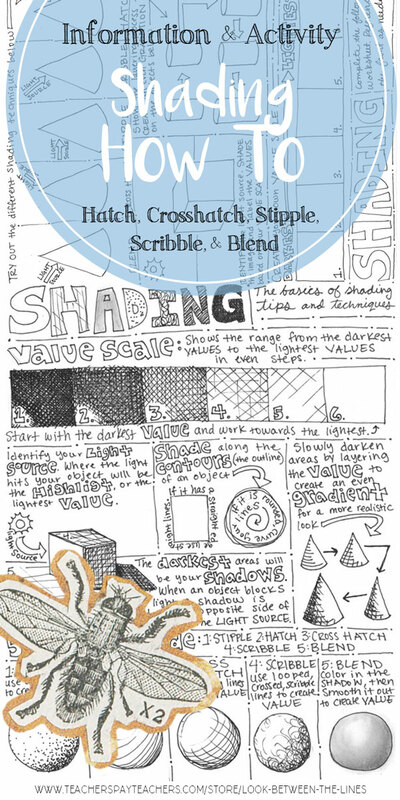 Value scale, highlight, tint, shadow, and shade are represented in this poster. 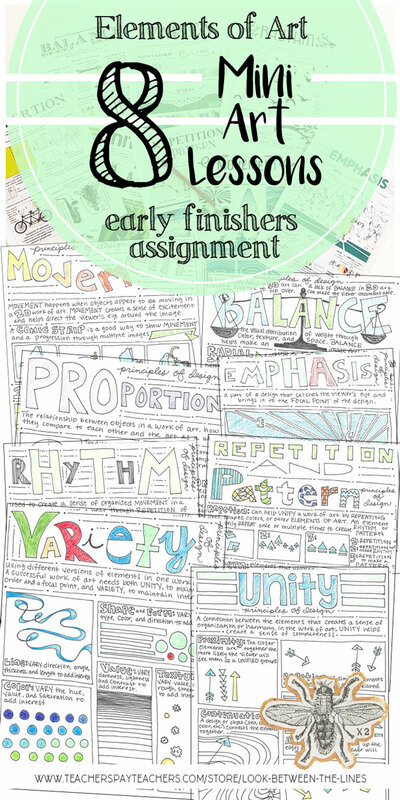 I hope other teachers find this resource useful in my Teachers Pay Teachers shop (check it out here!). I have already printed out a set to hang in my classroom, and I love how they look. 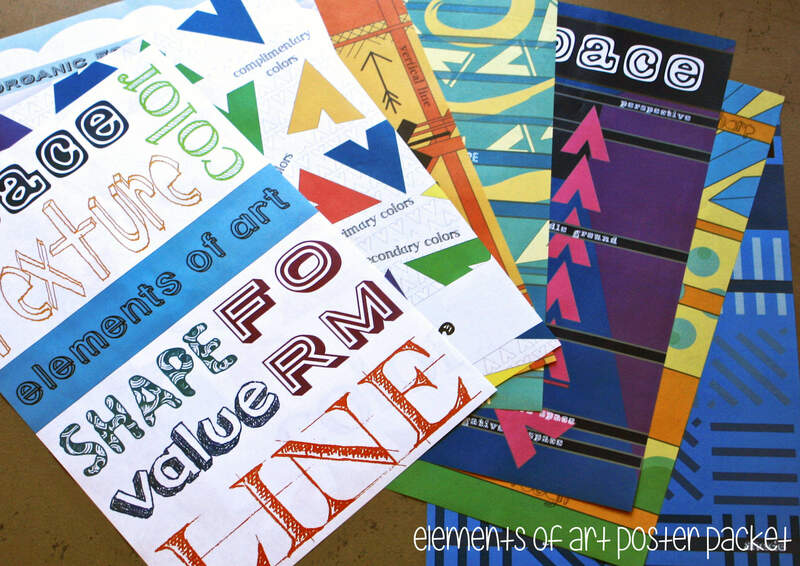 Thanks for taking the time to check out my elements of art posters! I hope they help inspire new ideas for your classroom. Help me spread the word about this post and my blog by sharing with others on your social networking site of choice. Thanks for stopping by!